In the 28 year history of the Festival of Trees, the Friends of Cranberry Hospice have donated over $1,900,000 to Cranberry Hospice to provide hospice services to patients and families in the communities of Bourne, Bridgewater, Carver, Duxbury, Halifax, Hanover, Hanson, Kingston, Lakeville, Marshfield, Middleboro, Pembroke, Plymouth, Plympton, Sandwich, Scituate, and Wareham. How can you be a part of the tradition? The Tree of Lights is a spectacular tree trimmed with hundreds of white lights and candles. Each light and candle represents a thoughtful donation made in memory or honor of someone special. If you wish, an acknowledgment of your remembrance will be sent to those you've honored and to the families of those you've memorialized. Their names will also be registered in the Tree of Lights Log which will be displayed next to the tree. 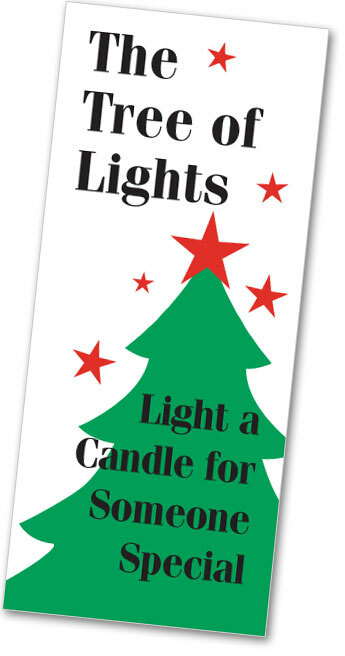 $5 lights and $25 candles may be purchased and donations to Friends of Cranberry Hospice will be welcome. Your tax-deductible donation to the Festival of Trees benefits Cranberry Hospice’s Children’s Bereavement Program as well as Direct Patient Care. Download Tree of Lights mail-in contribution form. View the Tree of Lights Log. Throughout our history, Cranberry Hospice has benefited from the charitable donations of community spirited neighbors. It is you who make Hospice's vital services available to many grateful families. Please know that your contribution will help "…add life to days when days can no longer be added to life." Please click the button below to donate. You do not need a PayPal account to contribute. Cranberry Hospice is dedicated to helping patients with life-limiting illnesses spend their final days at home surrounded, supported and comforted by the people they love. In addition, it provides a means of maintain ing dignity and quality of life. The medical, emotional, social and spiritual support of Hospice extends to patients and their families. During the final stages of illness, Hospice helps patients control their pain and ease their fears and anxieties. Hospice also provides support to the family through out the period of bereavement following the death of a patient. Established in 1989 to support the work of Cranberry Hospice, the Friends began the Festival of Trees to bring the gift of joy and the spirit of family, love and sharing to the communities we serve.